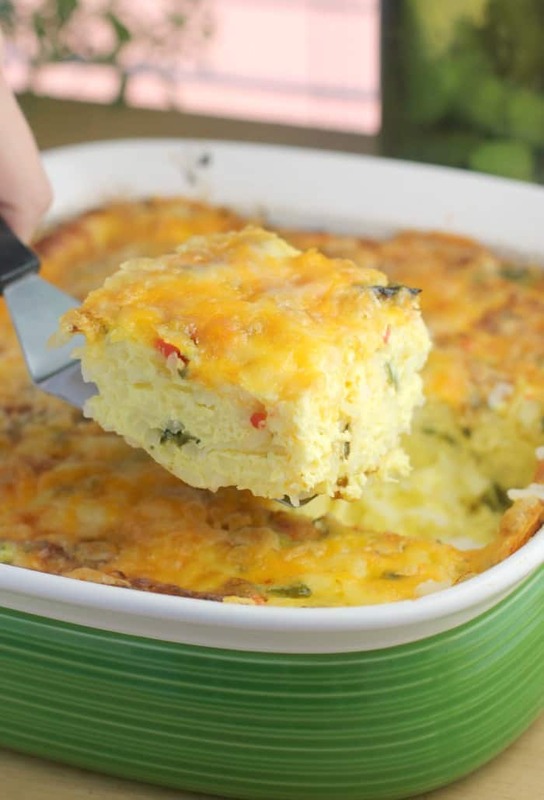 Roasted Poblano Breakfast Casserole. 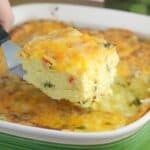 This easy, cheesy, egg casserole with tender potatoes and flavorful roasted, poblano peppers is a no-fuss, potluck-perfect casserole for any occasion. Oh my gosh guys, I have not published a new breakfast recipe is almost a year. A YEAR folks. I published a lot less in 2016 while I was focused training for my Ironman, but a whole year without a new breakfast recipe is kinda tragic. Because breakfast rocks and I’m a fan. 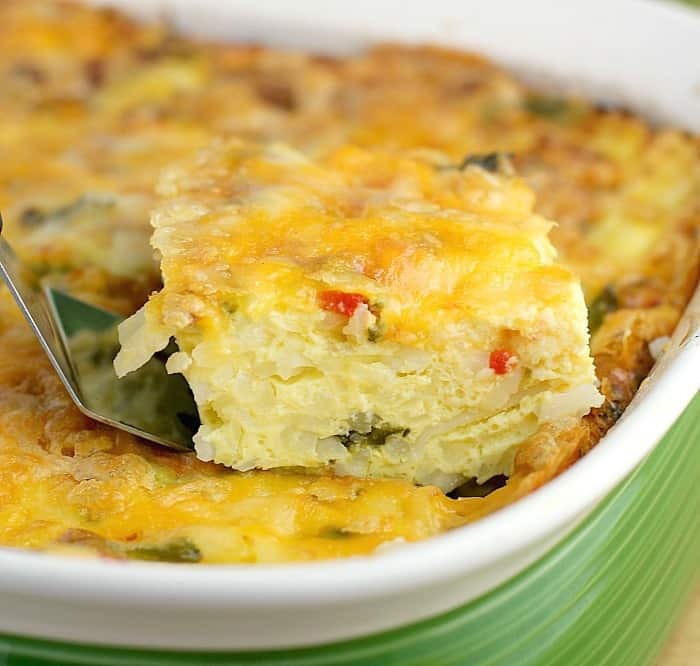 The story with this Roasted Poblano Breakfast Casserole recipe is simple. I wanted a tasty, cheesy, relatively easy but also impressive casserole. And I wanted to pull it off with no bacon or sausage. Because, doesn’t like every breakfast casserole out there have bacon or sausage? Is that really all necessary? Especially because I was going to bring this dish to a potluck-breakfast-at-work thing, and the bacon and sausage bases were already covered. Besides, I’m vegetarian. Also, I have a co-worker that cannot have gluten. 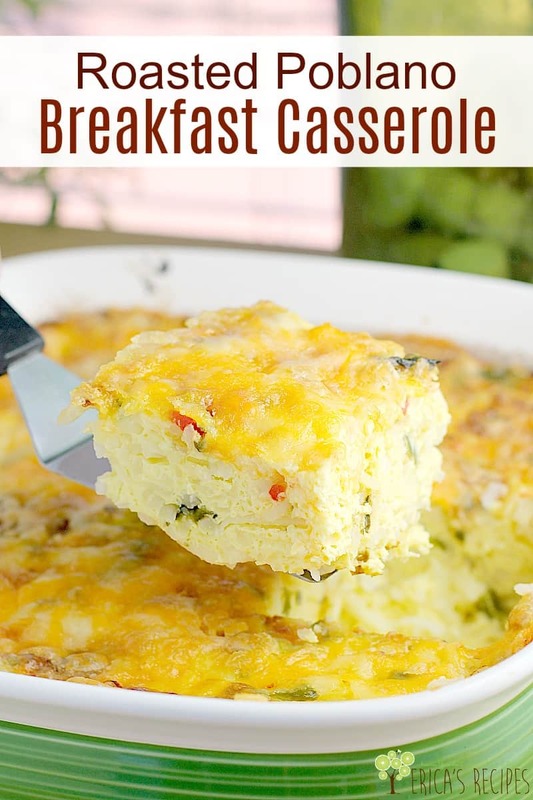 So I wanted a gluten-free breakfast casserole to be sitting all pretty amongst the sea of biscuits and bagels that I knew would be there …otherwise, I probably would have added condensed cream of mushroom soup, but now I’m glad I didn’t because while on the one hand, cream of mushroom is tasty in many traditional casseroles, on the other hand… it’s gross. So, no gluten. And no cream soup. Poblano peppers are wonderful if you have not tried them. They have a fantastic flavor that intensifies with roasting. They can sometimes have a little kick, but generally they are quite mild. On two separate occasions recently, we have gone to Mexican restaurants and ordered Queso Fundido that included roasted poblanos (one of those times being just last weekend, in fact). I guess I had poblanos on the brain. …not that cooking great gets me ahead in any way in my day job, but the public relations angle of it could only be positive. Now, the hardest thing about this dish is roasting the peppers – which is EASY and that’s the point. It’s just that it takes a couple of minutes is all. I stick them under the broiler for 20 minutes, rotating a quarter turn every 5 minutes. Then stick them in a bag to steam so you can get the skins off. Boom, very easy and totally worth it because roasted poblano peppers are magical. Then we just throw everything in a casserole dish. Potatoes, chives, seasoning, cheese, eggs, more cheese. …Really easy assembly here folks. I literally made this up at 5am the morning of, let it cook, snapped a couple quick photos, then carted it off to work. And because thie Roasted Poblano Breakfast Casserole was stress-free – and DELICIOUS – I will do it again. And again. And I see many possibilities of other ingredients to try in this casserole too. Ohhhh I love recipes with possibilities, don’t you? So that’s it folks! Hope you enjoy this Roasted Poblano Breakfast Casserole and please let me know if you do. It makes me happy. Heat up the oven broiler. Place the peppers under the broiler and cook each side (5 minutes per side) until skin is nicely blistered. Put the peppers in a ziploc bag to steam 5 minutes. Remove from the bag onto a cutting board and allow to cool until cool enough to handle. Remove the skins and seeds. Dice and set aside. In a bowl, whisk together the eggs, sour cream, and milk. Add a pinch of pepper and 1/2 tsp kosher salt. Whisk well to get in a little air. Set aside. 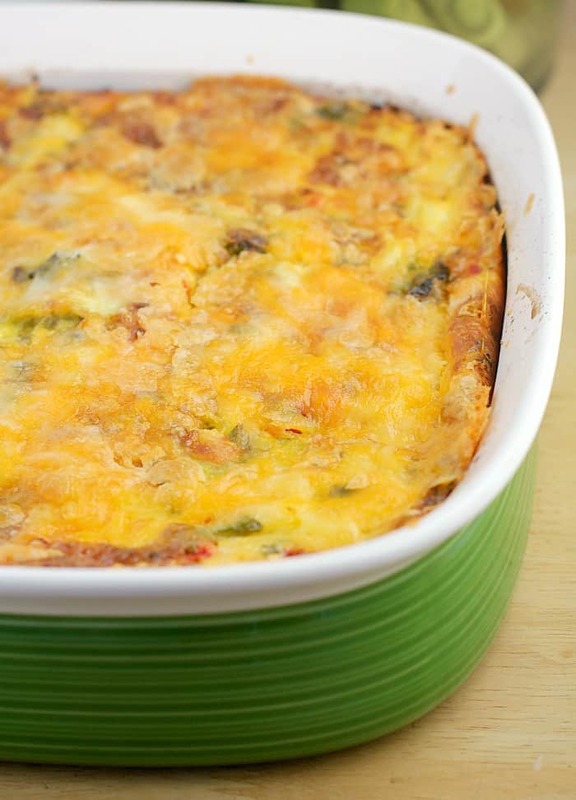 In a greased 13x9 or 2-3qt bake dish, layer the potatoes, poblano and bell peppers, chives, and 1-1/2 cups cheese. Sprinkle over a couple pinches salt and pepper. Pour the egg mixture over. Bake at 400F for 60 minutes until eggs are set and potatoes in the center are tender. Cover loosely with foil while cooking if top starts to brown too much or too quickly. Once done, top with remaining cheese and allow to melt. Remove from the oven. Yields: 8 servings. Leave me a comment, or else I’m just talking to myself here. What is your go-to brunch potluck dish? You know the way to my heart! This looks so good. I’ll have to make sure I have all the ingredients to make it, maybe this weekend. And yes, hash browns for the win!!! Erica, I totally love egg bakes. One of my favorite ingredients is poblanos. i love the smoky flavor they add. This dish would so end up on my table!